The Enduro World Series is about to start the 2016 season in style, all the way from the Patagonian coastline of Chile. The Montenbaik Enduro World Series race in Corral marks the second time the series has visited South America, but this time the high Andes of Nevados de Chillan have been replaced with coastal hills that will lead the riders all the way to the Pacific Ocean. Combining freshly cut trails with ancient pathways through a region known locally as ‘the cold jungle,’ round one looks set to challenge people’s perceptions of Chilean riding. With the venue only accessible by boat, the year’s season gets underway with a true test of brand new trails for every single rider, even local Chileans. Eduardo de Solminihac, Director of Montenbaik and one of the race organisers, said: “We wanted to change from the Andes to the coastal range mountains, where we have very special scenery by the Pacific Ocean. And of course the trails and terrain are great, so when you combine these elements it makes for the perfect EWS round. Coming back after an off season that saw some big team changes, round one will provide the perfect back drop to see how riders fare with new set ups and team mates. In the men’s field reigning World Champion Richie Rude (Yeti/Fox Shox) will be keeping a close eye on former team mate and mentor Jared Graves, who will be making his debut for Specialized Racing. Francois Bailly-Maitre (BMC Factory Trailcrew) has been on the cusp of an EWS win for a long time, and having just won the 2016 Andes Pacifico he’ll be coming into the season feeling strong. Justin Leov had a strong start to the season last year, but a shoulder injury in Whistler ruled out his title hopes, but the big Kiwi is back and will be looking to make things right this year with new team Canyon Factory Enduro Team. And the Giant Factory Off Road Team will be pinning their hopes on Josh Carlson and Yoann Barelli, who both came incredibly close to wins in 2015. There’s also a host of other talent that could really make their mark this season. Damien Oton (Devinci Enduro Racing) was plagued by injury last year, but he’s back to full fitness and has proven he’s got the speed after he won in La Thuile in 2014. Fellow Frenchman Florian Nicolai (Rocky Mountain Urge BP) is also hotly tipped for a win this year, having come so close in Scotland last year. Mark Scott is a new signing for the Santa Cruz X Sram Team, and the young Scotsman finished the season just outside the top 10 last year. In the women’s category, Cecile Ravanel (Commencal Vallnord) is widely touted as the racer most likely to walk away with the World Champion title - she was on the podium at every race last year. Anneke Beerten will be hungry for some good results for her new team GT Factory Racing, as will Ines Thoma (Canyon Factory Enduro Team) who came third in Finale last year. Katy Winton showed consistency all last year placing her in 10th in the overall, but with new team Trek Factory Racing behind her, she’ll be looking to better that this season. French rider Isabeau Courdurier (Sunn) came third in Whistler and Spain last year and is definitely capable of moving up the rankings this year, as are Anita Gehrig (Ibis Cycles Enduro Race), Andréane Lanthier Nadeau (Rocky Mountain Urge BP) and Raewyn Morrison (Lapierre Gravity Republic). Adrien Dailly (Lapierre Gravity Republic) will be leading the charge in the U21 Men, having dominated the category all last year. Hot on his heels will be Elliot Trabac (Scott SR Suntour Team) and Valentin Escriou. In the U21 Women, expect to see strong performances from last year’s World Champion Axelle Murigneux, as well as Martha Gill (Marin Stan’s Enduro Team) and Raphaela Richter (Radon Magura Factory Team). 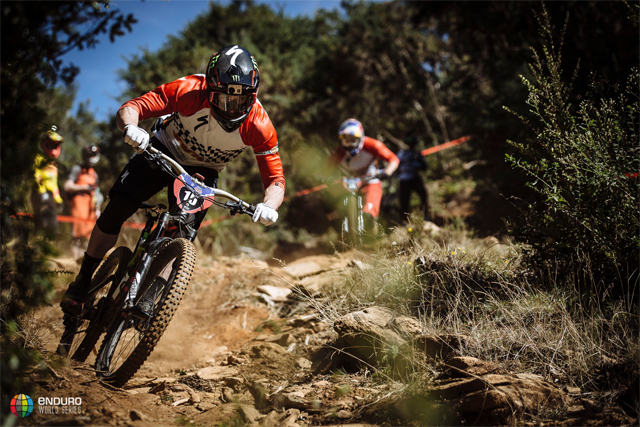 Woody Hole (Hope Factory Racing) had the Master’s title sewn up last year, but this year he’ll face tough competition from Cyrille Pages (MS Mondraker) and 2013 Master’s World Champion Primoz Strancar.